Abutilon theophrasti plant. modified from MissouriPlants.com. discoverlife.org (Accessed 4/2017). Abutilon theophrasti is an annual, C3 herb (Ward et al. 1999), stout, tap-rooted; 60-150 cm tall, branching, all parts softly hairy, dull green. A short-day (long-night) plant, flowering occurs about 12 weeks after emergence. Leaves alternate, stalks about as long as blades, blades broadly heart-shaped, 10-15 cm long and wide, tip long-pointed, base lobed, veins palmate, margin entire or few-toothed. Flowers yellow-orange, radially symmetrical, about 2 cm wide, 5-parted, anther stalks fused together in a central column. 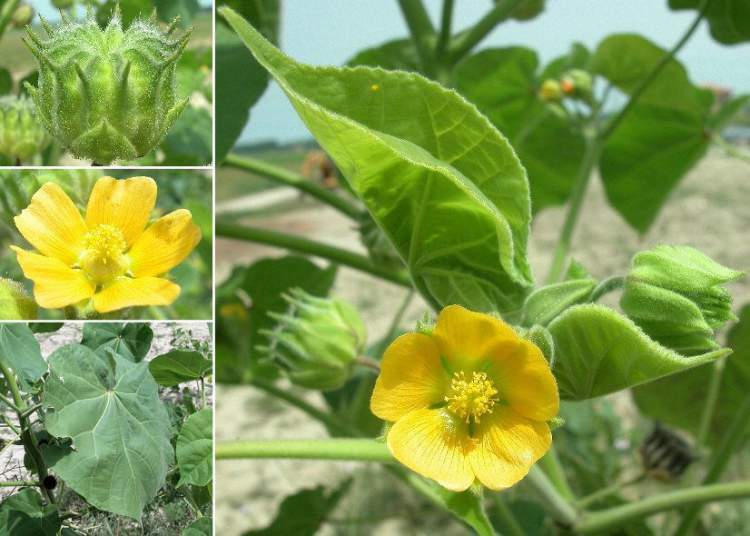 Single or few together on stalks 2-3 cm in axils, self-pollinating; blooms and fruits July-Oct.
Abutilon theophrasti. Andrea Moro – Creative Commons Attribution Non Commercial Share-Alike 3.0 License.luirig.altervista.org (Accessed 4/2017). Fruit dry, hollow, becoming black, radially symmetric, densely hairy capsules about 2.5 cm wide, with 12-15 chambers, each chamber with horizontally spreading beak, persistent through winter; seeds about 0.3 cm, brown, kidney-shaped, velvety, 3-9 per chamber, seeds mature about 22 days after pollination. 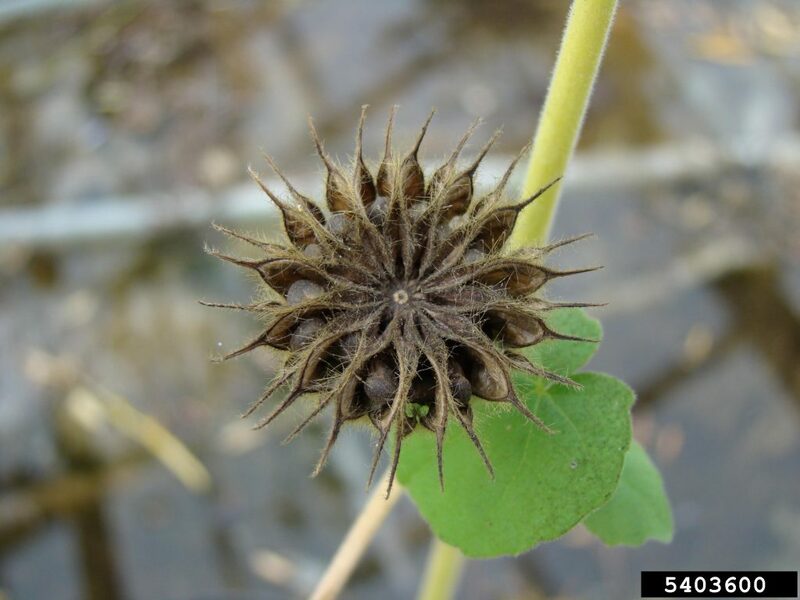 Seeds viable for up to 50 years in soil; seed coats contain phenolic compounds that inhibit bacteria and fungi (Levine 1995; Warwick and Black 1988). 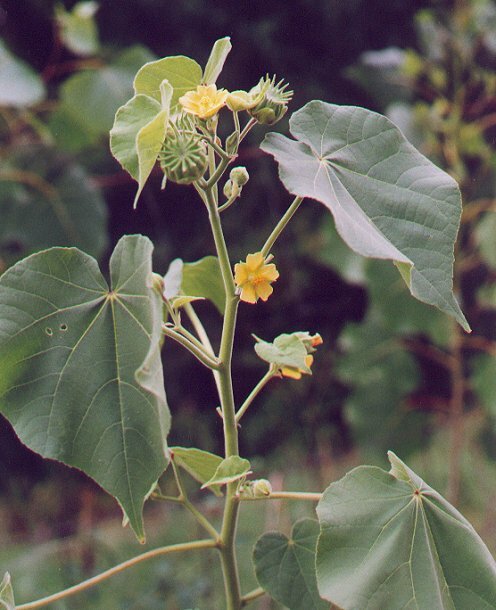 Abutilon theophrasti. fruit and seeds. Rebekah D. Wallace, University of Georgia, Bugwood.org (Accessed 4/2017). Habitat: An agricultural weed, open or part shaded uplands, fill, fields, soil pH 6.1-7.8 (Warwick and Black 1988). Notes: Allelopathic to germinating seeds and roots of seedlings. However, the toxin is rapidly degraded by microorganisms in the soil. Host to numerous fungi on both leaves and roots including the anthracnose Colletotrichum coccodes, Fusarium spp., (Deuteromycotina), Gliocladium roseum and Peniccillium frequentans (Deuteromycotina). Roots attacked by several nematodes including Meloidogyne hapla, the northern root-knot nematode. Seeds are edible, used as food in China, where the plants have also been grown for fiber. (Warwick and Black 1988; Agrios 1988).